This two-day tour (White Canyon – Ain Hudra – Double Canyon – Wadi Rum) will lead us through three canyons, one oasis and lots of big sand dunes. We will start our trip with a camel ride to the White Canyon (further description under “White Canyon”). After passing this first site, we will visit the oasis Ain Hudra with its fruit garden and the two little rivers. From there we will continue on camels’ back for another two hours until we reach the place of our lunch break. With the new strength acquired here, we will then hike through the two canyons where we will have enough time to take photos, admire the beautiful view or just enjoy the quiet of the desert. 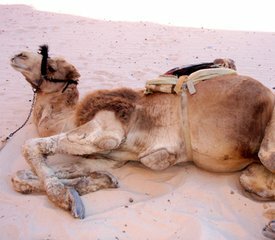 As soon as we get back we will hop on our camels again and ride to our sleeping place. After breakfast the next day we will do the last hike of this trip, passing rugged rock formations and huge sand dunes. We will ride back to the jeeps on our camels and from there return to Dahab.. The Bedouins will prepare their typical fresh bread over the open fire and a tasty lunch for us. Our path will be lined with rocks and stones in every shape, size and color imaginable.. Enjoy campfire romanticism and the indescribable feeling of the desert - Our camel tour is suited for young and old alike!.